COCOA BEACH, Fla. – The National Association of Rocketry (NAR) will convene its next annual national convention, known as NARCON, on Florida’s Space Coast during the weekend of Feb. 28 to March 2, 2014. “Hosting NARCON 2014 here on the Space Coast is just a natural,” said Patrick McCarthy, chairman of the NARCON 2014 organizing committee and director of spaceport operations for Space Florida, the state’s space agency. “Our focus will be on the past, present and future of rocketry at all levels – from the beginning model rocketeer to the professionals flying the real deal all the way to Earth orbit and beyond,” McCarthy said. Tours of nearby Kennedy Space Center and Cape Canaveral Air Force Station will be available, and an opening reception will be held at the Air Force Space & Missile Museum History Center. 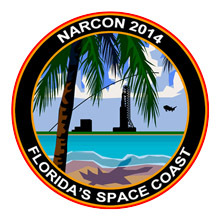 The International Palms Resort and Conference Center in Cocoa Beach will serve as the beachfront host to NARCON 2014. More than 100 model rocketeers from around the nation are expected to attend. This entry was posted in NARCON and tagged convention, events, nar, narcon by Roger. Bookmark the permalink.